The first high performance, personal abrasive waterjet. Engineered by the best minds in the abrasive waterjet industry and powered by OMAX technology, the revolutionary ProtoMAX is designed for quick and precise abrasive waterjet cutting. 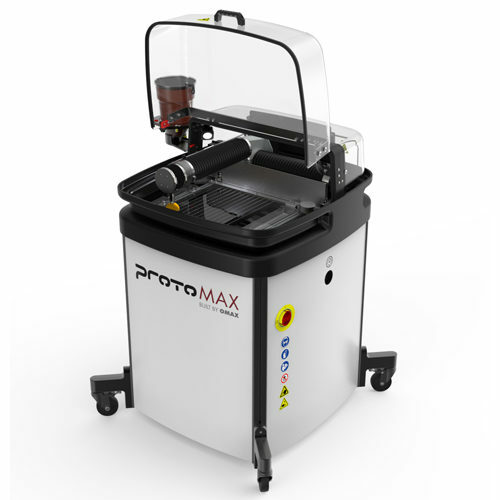 Capable of powering through almost any material, the ProtoMAX is the ideal solution for prototyping or small-scale production. With a design that’s accomodating to educational facilities, the ProtoMAX is engineered to maximize instructional potential. Utilizing the same advanced cutting model and similar control software as OMAX industrial waterjet systems, the ProtoMAX can take students from the classroom to a production shop floor quickly and intelligently. Teach not only material diversity but also the design flexibility that abrasive waterjet machining can bring to manufacturing.